In a 9 inch pie plate or cake pan, spread the frozen hashbrowns out evenly until the bottom of pan is completely covered. You may need to run a small amount of water over the hashbrowns to break them apart, but pat them dry before putting them in pan. Melt the butter and pour over the hashbrowns. Add a little salt and pepper and mix well and then spread out again evenly in pan. Bake 25 minutes. Potatoes should start to turn lightly brown on edges. At the same time, mix all other ingredients in a mixing bowl. Once the hashbrowns are ready, pour the mixture over them. Turn oven down to 350 degrees and bake quiche until golden brown on top, approx 25-30 min. Alternatively, for a vegetarian quiche, just leave out the sausage and add half a bell pepper, finely chopped and cooked the same way as the chopped onions. Mix all ingredients together with a wooden spoon. Place by the tablespoon on a baking sheet lined with parchment paper. These will almost double in size so place them about an inch and half apart. Store in the freezer in a freezer bag for about a month. Reheat in the microwave for about 30 seconds for every 4 biscuits. In a large pot, cook diced tomatoes on medium heat, stirring occasionally. In a separate skillet, heat olive oil and then cook diced bell peppers for a couple minutes, then add onions. Cook another couple minutes, then add minced garlic and cook until tender. Pour the skillet mixture into the large pot of tomatoes and stir well. Add a couple TBS chili powder, and the 2 cans of Rotel. Cook approx. 30 minutes over medium heat, stirring occasionally. The goal is to cook until the tomatoes are very done. Add remaining 3 TBS chili powder and salt and pepper to taste. Stir well. Add the 4 cans beans and cook about 15 more minutes, or to desired thickness. This makes enough to serve the family and can about 5 pints, as well. Cook 1/2 lb. black beans per package directions (I like to soak mine overnight before cooking) and add 1 chopped onion to black beans while cooking. Once beans have cooked about 3 hrs, check for doneness and if done, remove from heat and salt and pepper to taste. Cook 1 and 1/4 cups zataran rice per package directions adding 2 TBS olive oil. While rice is cooking, wash the whole bell peppers and cut the tops off each one (see pics below). Remove seeds. Set the large sections aside and remove the middle of the top sections. Chop the bell pepper remaining from the top sections and also chop the remaining onion and the garlic. Sauté these chopped vegetables in about 3 TBS olive oil until tender. Remove from heat. Drain Rotel tomatoes and sauté for about 8 minutes over medium heat being careful not to inhale the peppery steam from the habaneros. In large pot, boil the whole bell peppers for about five minutes. This will help assure the bell peppers are very tender when finished baking laTer. Drain. Carefully remove from pot (I use two spoons to avoid tearing them) and place in a baking dish lined with foil or parchment paper. Add a dash of salt to inside of each whole bell pepper. Mix together in a small bowl the following ingredients: cayenne, cumin, cilantro, 4 TBS olive oil…if extremely thick, add a little more olive oil. Add this mixture to the cooked rice and mix well. Add the cooked black beans to the cooked rice and salt and pepper to taste. In large bowl, mix together 4 cups of the black beans and rice mixture, the sautéed vegetables (onions, garlic, bell peppers), the heated Rotel tomatoes and 1 cup of shredded cheese. Save the remaining 1 and 1/2 cups of shredded cheese for later. Carefully spoon the mixture into each whole bell pepper that is in the baking dish until each pepper is full. Bake the stuffed peppers for 25 minutes, then remove from oven and top each whole stuffed bell pepper with the remaining shredded cheddar cheese. Bake 10 more minutes. Remove from oven and top with your favorite toppings such as sour cream, avocados, etc. Enjoy! 1 package Black Beans, prepared ( I rinsed them and then brought to a rapid boil, covered in about 5 cups water for two minutes, then I removed from heat and soaked them for two hours…I drained and rinsed, then added about 8 cups water and I cooked them three hours on a low simmer with the lid partly askew so the steam could escape…during the last hour I turned up heat a little, and with lid on…I checked intermittently to make sure the water had not boiled out)…desired consistency is tender, but not tough or mushy…a little firm is good. After cooking the onion and garlic, add it to the beans and prepare as noted above. Prepare rice per package instructions. 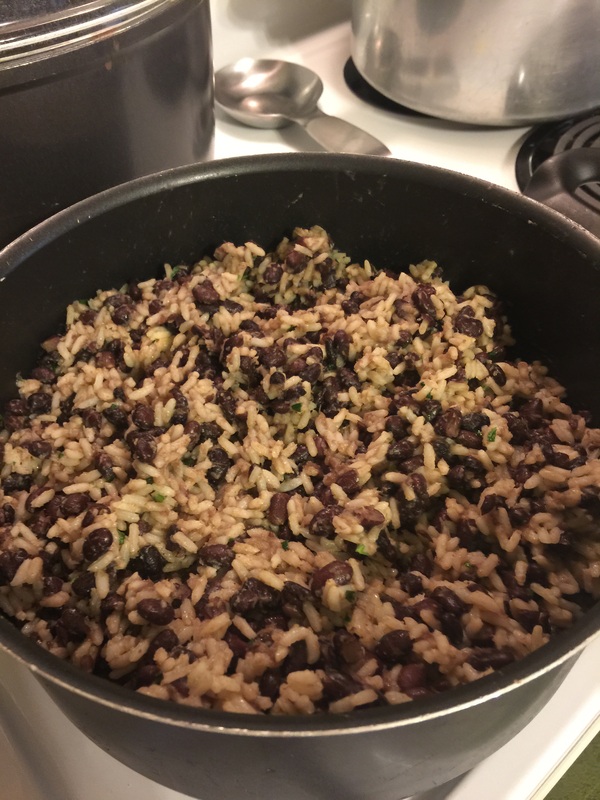 Once beans and rice are done, in a small bowl mix together cumin, cayenne, cilantro and olive oil. If it appears thick like a paste, add a bit more olive oil. Pour into rice and stir. With a ladle with drainage holes, dip beans (slowly, allowing to mostly drain) into the rice. Stir together. Salt and pepper to taste. In large sauce pan on hi, heat olive oil. Add vegetables and spices except soy sauce. Stir frequently. Let cook approx 5 min then add soy sauce. Cook approx 2 min more and season to taste, then put cornstarch into large coffee mug and pour hot liquid from sauce pan over cornstarch. Stir until well blended and pour over vegetables. Add water. Cook until desired thickness. Serve with cooked angel hair pasta (or cooked rice). My sis Lavonda is an amazing chef! I needed a vegetable lasagna recipe this weekend and I knew I could count on her to create the perfect dish! 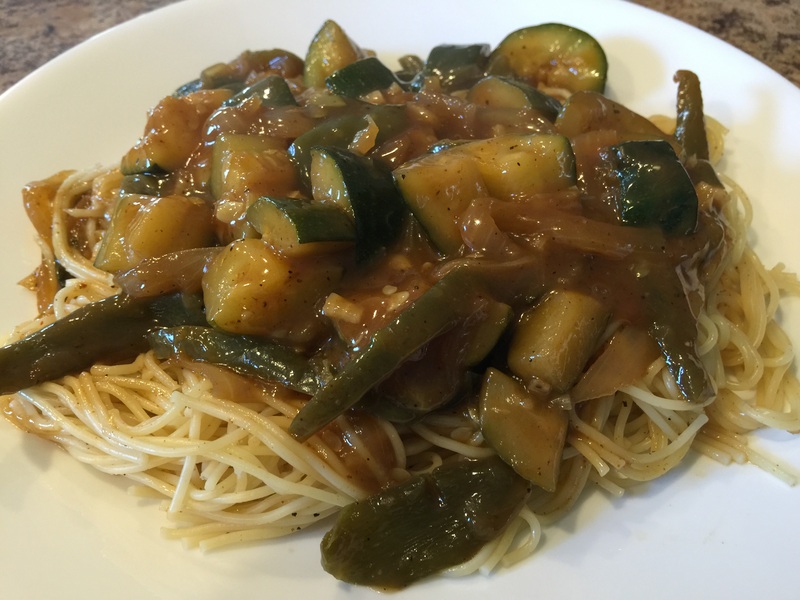 The following recipe is what she created for me to make and it was wonderful! The only things that I did differently than her recipe were to double the recipe and add oregano and salt to my sauce, just a matter of personal taste preference. I used to grow oregano and I cannot get enough of it in my Italian dishes! Mix all ingredients together until well blended. Cover bottom of casserole dish thinly with vegetables and sauce. Add a layer of the ready for baking lasagna noodles (no boiling needed), spread ricotta mixture over noodles, top with vegetables and sauce, then add a layer of shredded cheese. Repeat until casserole dish is full. Cover top with parchment or wax paper, then cover with foil. Bake at 425 for 30 minutes. Uncover and cook until bubbling and cheese on top has browned (about 15 more minutes). Note from Teresa: when I doubled the recipe, I also doubled all my cooking times for the sauce to allow for the extra ingredients and I increased baking time by about 10 minutes before removing the foil/paper to allow time for the extra lasagna to bake in the oven…I made one large, one medium and one small lasagna when I doubled the recipe).